Comic Life is a comic-creation app that can be used to create the comic book by either starting from scratch or from one of the templates. Photos, shapes, text and speech bubbles can be added easily and customized to each individual's preference. Many of the available fonts are similar to commercially produced comic books which adds to the authenticity. There are many sharing options available when the comic books are completed. They can be printed, saved to the camera roll, transferred to other iOS devices, or saved as a PDF and opened in iBooks, just to name a few of the choices. The Most Powerful Photo Comic Creation App Available. Comic Life has the most features and works best on an iPad because of the bigger screen... I love the way the app allows you to edit tiny details, from the shape and style of word bubbles to the size and placement of each story cell. Introducing an integrated Script Editor*, next generation image filters and built in Instant Alpha tool. New graphics features include speedlines, halftones, updated stroke options and more! Dozens of fully customizable templates. Everything you need at your fingertips: speech balloons, photo filters, comic lettering, templates, shapes, shadows and effects. Packed with fonts, templates, balloons, captions, and lettering art, Comic Life is a fun, powerful and easy-to-use app that makes creating comics easier than ever. And now you can build your comics anywhere you like! 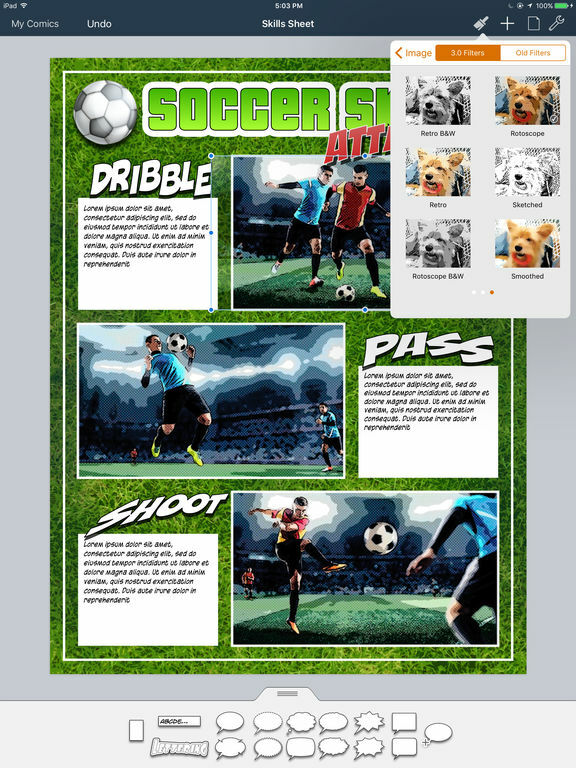 Easily go from taking photos to creating full comics all on one device with full page templates and panel layouts. Create original stories with the integrated Script Editor then drag and drop your words to the comic page when you're done. Bring in photos from your photo library or access web photos via Flickr integration, and the app’s powerful editing and design tools to get exactly the look you want. When your work of art is complete, use the integrated reader to review pages on your device. Or share with your friends and family. Choose from Facebook, Twitter, email or open your comic in another app as a PDF. Dozens of full templates with hundreds of panel layout options. Read your comics with the integrated e-reader. Create photo comics in the full featured comic editor. Share your comics on Facebook, Twitter, via Mail, AirDrop and iTunes File Share. Transfer your comics to Mac or Windows and keep working with Comic Life 3 on your desktop or laptop. Send your comics to a printer on your wireless network. 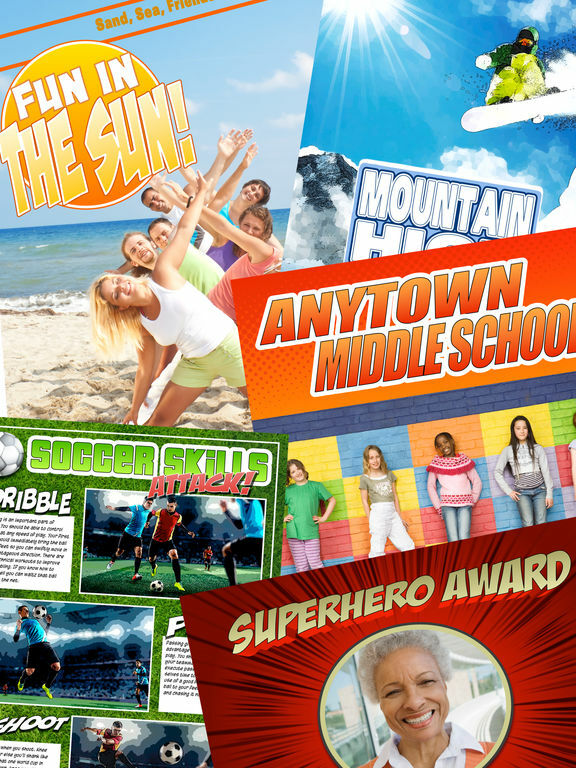 Choose from full page layouts including panels, titles and captions along with complimentary styles for a high end look. Drag and Drop elements anywhere in your comic page. Easily add photos from your library with the Place Photo button in panels. Curve and place balloon tails precisely with advanced tail controls. 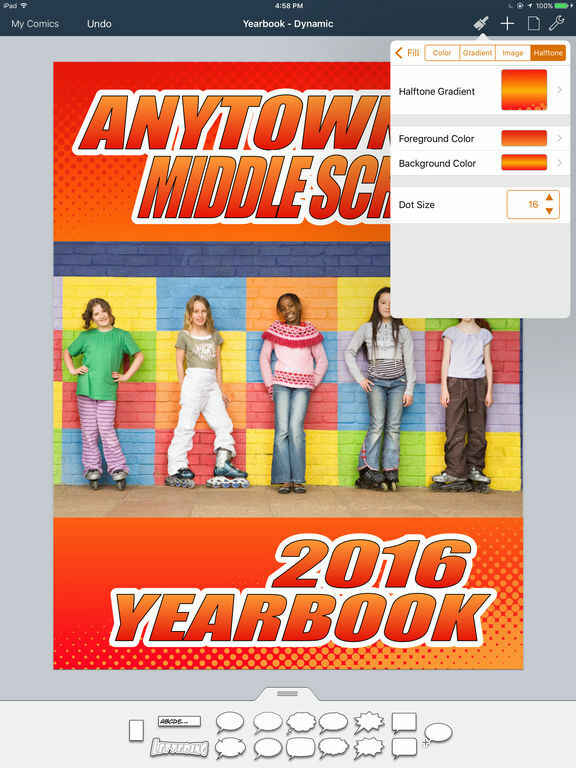 Resize and rotate images, clip them in panels along with balloons, captions, and lettering. Create multilayered color gradients to design the perfect style for lettering, captions or background. Use smart shapes to add common shapes and the free form shape drawing tool to create any line or shape you can imagine. Work without worry of losing your creation as documents are automatically saved whenever a change is made.